Update - 2018.11.20The Pro X7 has been discontinued and although you may still be able to find some of the standard edition online (mostly refurbished devices), the slope edition is no longer available at all. Luckily Bushnell recently released the Pro X2 which offers many of the features that made the Pro X7 so popular. It even has Slope-Switch technology which means you can choose between a tournament legal device, or a slope rangefinder, with the switch of a button. Check out our review of the Pro X2 here. 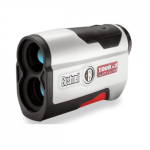 Bushnell goes all out with the Pro X7 with JOLT golf laser rangefinder. Of course it’s going to have E.S.P. 2 (Extreme. Speed. Precision. ), Vivid Display Technology (VDT), and 7X magnification with HD optics. But, what you probably should know about is the true 1-mile ranging performance of this Pro X7 with a full 550 yards to the flag. And, to boost confidence of those far-reaching flag distances is PinSeeker with JOLT Technology. Dozens and dozens of reviewers online have chimed in to rave about the Pro X7 with Jolt. It’s worth it to also note that the majority of the reviewers are verified purchases who have actually used the product. Believe the numbers. It’s got a near perfect rating with a large percent of reviewers giving it a perfect score. Yeah, it might be a little big compared to the others, but its high performance far outweighs its bulky size. This Bushnell Pro X7 Slope with JOLT is a beast of an optic with a full 1-mile ranging capability and flag-measuring out to 550 yards. Those distances are locked in with PinSeeker Technology and JOLT and delivered with lightning-fast speed thanks to the E.S.P. 2 (Extreme. Speed. Precision.) feature. Complete with Slope Technology that’s displayed with Vivid Display Technology (VDT) and 7X magnification, you’ll never have to count strokes again. The Pro X7 Slope with Jolt is the same unit as the Pro X7, save for Bushnell’s built-in slope technology. It can also boast of its ability to give you the slope adjusted distance you need. With the angle included, you can make the best club selection to make the best shot possible. It’s not as compact as the other golf laser rangefinders, but it makes up for it with the improved optics. It’s holding an outstanding rating online with with the majority of reviewers giving it a perfect score. What is the magnification on the Pro X7? Unlike the other golf laser rangefinders in the Bushnell line with only 6X magnification, the Pro X7 with Jolt has 7X magnification. Whoa, right? This is the maximum amount of magnification you’d want with a vertical design, however the Pro X7 actually features a horizontal design. This isn’t a bad thing since its horizontally-held form helps to improve image steadiness by holding the rangefinder with two hands if you feel you want to. The trade off? You’d have to put your club down. What is the maximum yard range of the Pro X7? Get ready for this – 1760 maximum yards is what the X7 with Jolt can range out to. Let me do the math for you – that’s one full mile. That’s a pretty hefty golf course you’ve got there, unless you’d want to do other things with it, say, target shooting or hunting? With a yard range like that, the option is there. Now speculation aside, it’s accurate to within -/+1/2 yard and it can range 550 yards to the flag. You’ll be able to get distances to any flagstick on the course. What is VDT and does this rangefinder have it? This device does have VDT which stands for Vivid Display Technology and is saved only for their premium rangefinders. Using the red LED display, you’re able to get better clarity and light transmission despite the lighting conditions that you’ve been fated with. Some people complain that it may be too bright in low light conditions or very dim when the sun is out. To solve these issues, VDT offers four user adjustable settings so that you can see better, read better, and swing better without consulting the Weather Channel first. What kind of batteries does it take? This rangefinder takes the abundantly available CR-123 lithium ion batteries. Although it’s easy to find in most urban areas at any gas station or convenient store, you might want to buy a few extras just in case. It’ll be a shame for your unit to die in the middle of a par, have to stop your game, and run out for a spare. No matter how much you want time to stand still for you, the game must go on! 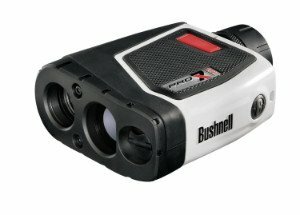 How much does the Bushnell X7 cost? You’re looking at one of Bushnell’s premium rangefinders that’ll dent your bank account about $400. Although you’re getting a battery, case, and two year warranty included in the cost, you’re also paying for the top-of-the-line HD optics, the waterproof protection, the vast yard range, and the faster, more accurate technology that gets you precise distance readings in all types of skies. To ping up the strokes, the Bushnell Pro X7 Series is a testament to the fine things in life. It encompasses the best of the best that Bushnell has to offer. Looking further a field at other brands, the Leica Pinmaster II is a sight to behold. While it lacks slope adjustments, the superior glass, compact form, and magnification factor of 7X will ensure you’ll never miss the hole again. The Pinmaster II Pro has slope adjustments if you want to get in on what’s new! 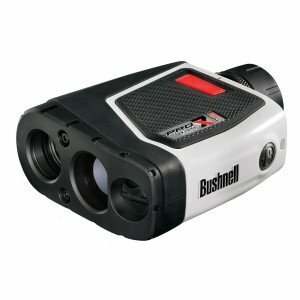 But, you can depend on Bushnell if you want to stay within the reasonable price range for a golfing rangefinder. 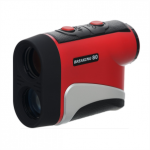 Breaking 80 IS500 Rangefinder - CLASSIC DESIGN is Back!